These days, homeowners are turning their garages into man caves, an additional bedroom or mother-in-law suite, a laundry room, an office space, an at-home gym, or to simply create a more effective storage solutions to better manage their belongings. Whatever your garage renovation needs are, the skilled handymen at Larlin's Home Improvement have over 15 years experience handling garage renovations in a timely and affordable manner. Renovating your garage is a quick and affordable way to improve the living space in your home. Since 2004, Larlin's Home Improvement has offered a wide variety of garage renovation services to local homeowners. Our attention to detail and quality craftsmanship provide homeowners with a newly renovated garage that improves their day-to-day living needs by transforming unorganized garages into fully functional spaces. All garage renovations by Larlin's Home Improvement are completed with care, structural beauty and function. Call (203) 267-0607 for a free quote! Tired of Tracking Dirt onto Your Garage Floor? 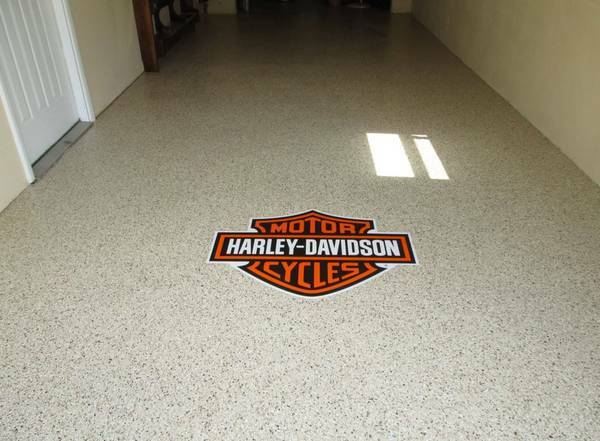 Consider having Larlin's Home Improvement install epoxy coating for your garage floors! Having your garage floors coated with epoxy is not only a practical solution to keep dirt and oil stains from ruining the floor, but it provides a low-maintenance, beautiful finish that will give your garage floor a lasting finish that will shine. Epoxy coating garage floors is one of Larlin's Home Improvement’s specialties. One gleaming floor at a time, epoxy coating will provide durability that you’ve been looking for. Call (203) 267-0607 for a free quote!